Cosmetic Dentist in Framingham Encourages Questions! Whitening may not be advisable for all patients—for instance, if you have several tooth-colored dental restorations. Sometimes, whitening products can cause adverse effects, such as tooth sensitivity and gum inflammation. Typically, this happens when you don’t have the right dental professional caring for your smile while undergoing your whitening treatment. However, meeting with your dentist before a cosmetic treatment can clear up a few different things—including how to avoid the problems listed above. Your cosmetic dentist in Framingham is here to help you through the process of whitening your teeth safely—assuming you’re the perfect candidate for this treatment. In fact, there are a few different questions that you should ask to kickstart the conversation with your dental expert. Continue reading to learn more. You might be nervous to talk about what you don’t like about your smile, but a cosmetic dentist is definitely the one to tell all to. After all, they are here to help you improve your aesthetics. Talking about your insecurities and what you want to do to improve your look can ensure that your dentist helps you achieve the results you really want. Here are a few examples of questions to ask during your next cosmetic appointment. How long can I expect my whitening results to last? Contrary to drugstore whitening products, professional teeth whitening can last months at a time with the proper maintenance. Your dentist will be able to provide details about how to maintain those results with you. Will the whitening solution damage my teeth? Of course, professional-grade products are much stronger than what you get in the local store. However, your dentist is here to make any accommodations that you may need to keep your smile safe. If you have sensitive teeth, your dentist will be sure to note that before continuing with your treatment. Is bleaching safe for all ages? Although your little one might want white teeth just like mommy or daddy, professional whitening should be reserved for young adults and mature patients. Younger children are still experiencing smile development and may even have orthodontics that could get in the way of the treatment. What will the bleach do to other parts of my mouth? 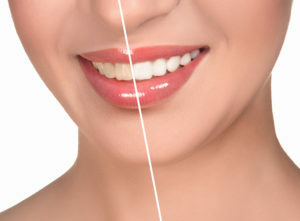 The great thing about professional teeth whitening is that your dentist is here for you every step of the way. This means that during your one on one whitening visit, your dentist will add a custom protective layer between the bleaching product and your soft tissues like your gums to keep them safe. As you can tell, meeting with your Framingham cosmetic dentist first is important! Don’t miss out on the opportunity to learn more about what to expect, avoid, and how to maintain results when it comes to whitening. Our team here at Framingham Premier Dental always want to keep your smile safe, but we want you to love how your teeth look, too! That’s why we always encourage patients to give our office a call and schedule consultations before assuming that any treatment can be completed at anytime or by anybody. Learn more by giving us a quick call today! Enjoy At-Home Teeth Whitening in Framingham Today!